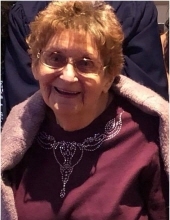 Marjorie Ann Brightman, 83, formerly of Bristol, RI, passed away September 2, 2018 at Pine Grove Nursing Home in Pascoag, RI. Ms. Brightman was born on January 15, 1935 in Boston, MA, to parents Robert and Marjorie (Wells) Brightman. She is survived by her sister Elizabeth (Brightman) Dorcus and her brother Robert Brightman, as well as her four children; Peter S. Brightman, Russell S. Brightman, Kimberly A. (Brightman) Krupowicz, and Kerri J. Brightman; and three grandchildren. Ms. Brightman was a Lab Technician in the Blood Bank at Cranston General Hospital as well as other private labs within RI. She enjoyed playing the piano, knitting, stained glass, and painting, and with a giving heart, she freely gave her creations to others to enjoy her work. She sang in the Bristol Senior Citizens Chorus for many years which delighted many during the Bristol Fourth of July celebration concerts. Ms. Brightman enjoyed gardening and flower arranging. Above all, she absolutely loved her Lord and Savior Jesus Christ where she now abides with Him forever. Ms. Brightman will be buried in Oak Grove Cemetery, Hopkinton, RI. There will be a private memorial at the grave site, date TBD. All are welcome to celebrate her life. To send flowers or a remembrance gift to the family of Marjorie A. Brightman, please visit our Tribute Store. "Email Address" would like to share the life celebration of Marjorie A. Brightman. Click on the "link" to go to share a favorite memory or leave a condolence message for the family.